Will Lasik Work For Me? What is Epi-Lasik, ASA & PRK? How Do I Know What Is Right for Me? Choosing a Surgeon-What sets us apart? The team of board-certified ophthalmologists at Northern Ophthalmic Associates knows that dry eyes can be very uncomfortable and distracting for our patients. We understand that after a while dry eyes can start to take a toll on quality of life. Our goal is to quickly identify the cause of the problem and treat it in order to reduce symptoms and restore ocular health. Many factors, including allergies, medication and contact lenses, can trigger the occasional bout of dry, itchy eyes. However, chronic dry eye syndrome is caused by decreased tear production or increased tear evaporation. Tears are critical for keeping the eyes lubricated, washing away dirt and debris and reducing the risk of infection. Tears have a mixture of water, mucous and oil; the water moisturizes the eye, the mucous helps spread the tears over the surface of the eye and the oil keeps the tears from prematurely evaporating off the eye’s surface. If an insufficient number of tears are produced — or if the tears produced have an insufficient amount of oil — dry eye syndrome can occur. The meibomian glands play a key role in tear production, as they are responsible for secreting oil to prevent the tears from evaporating. 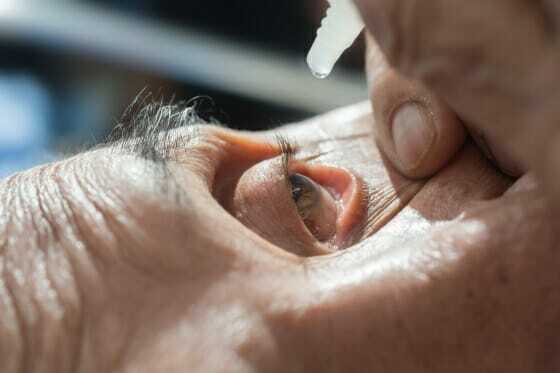 Who Is At Risk of Dry Eye Syndrome? Anyone experiencing dry eye symptoms is encouraged to see one of our ophthalmologists for a screening. Our ophthalmologists can use several different techniques to measure the production and composition of the tears. We look at the eyelids and the surface of the eye in order to determine the exact cause of the condition. If a diagnosis of dry eye is confirmed, we can review the appropriate treatment options. Our goal is to identify what causes dry eye — whether it be decreased tear production or a chemical imbalance of the tears — and treat that. A common therapy for dry eyes is using artificial tears and lubricating ointments to supplement the moisture in the eyes, thus alleviating symptoms. Artificial tears are used throughout the day and the ointment applied before bed. We can recommend over-the-counter or prescription options, based on the case. Other drugs like Restasis are designed to treat the cause of dry eye by boosting tear production. These can be used alongside artificial tears. Punctal plugs are an effective way to stop tears from draining away. The tiny implants fit into the tear drainage ducts. Some plugs are temporary and dissolve after about three months, and others are permanent. The plugs cannot be seen or felt in the eye. If these methods fail to work, a minor, in-office procedure to close the tear drainage system may be recommended. This helps to conserve natural and artificial tears. If you experience dry, itchy or burning eyes, you could have dry eye syndrome. Northern Ophthalmic Associates invites you to call or email our office and request an appointment to be screened.